Natalie Merchant Opens Conference with a Bang! 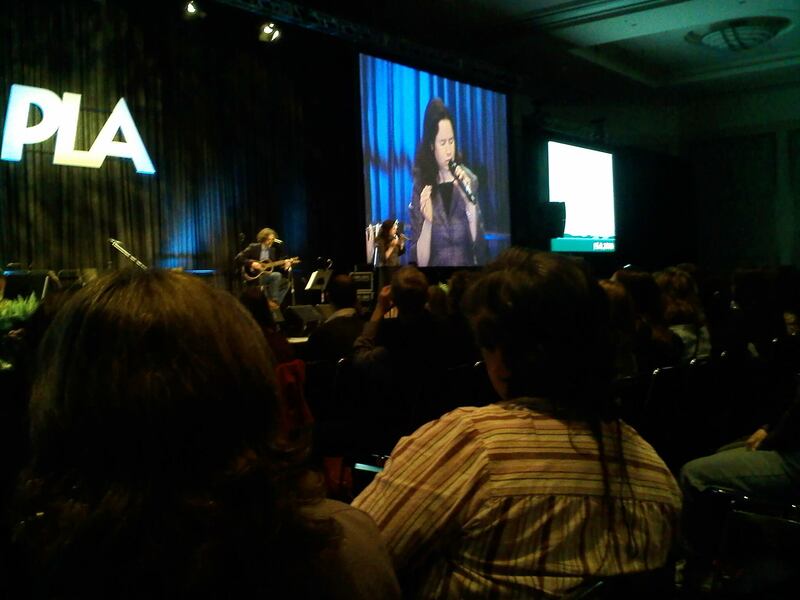 Singer-songwriter-musician Natalie Merchant opened the Public Library Association’s 2010 conference today at 1:30 p.m. with a presentation and concert featuring songs from and the story of her newest album, Leave Your Sleep. In this album Merchant has adapted and put to music the words of many poets, some well-known, others quite obscure. Her presentation included photo slides and notes of and about her various collaborators. And, while her comments were both elucidating and entertaining, it was the music that stole the show. Accompanied by a pair of guitarists and a cellist, Ms. Merchant’s resonant voice filled the Oregon Convention Center’s Portland Ballroom with beauty and emotion. The approximately ten songs the musicians performed were alternately moving and funny, joyful and serious. It was a wonderful performance, and an inspired pairing of words and music, that left us wanting more. Clearly moved by, as she put it, “an opportunity I never thought I’d have,” Merchant had to stop singing twice to compose herself. Finally, she continued to sing as she walked through the audience shaking hands, and calling out the states of the librarians she was thanking. There wasn’t a dry eye in the hall. Next up: Keynote speaker, New York Times columnist, Nicholas Kristof.